I am really excited to share this recipe with you. I have been trying to perfect this one for awhile and I’ve finally gotten the stamp of approval from my family. My oldest daughter told me this tasted better than anything from an Italian restaurant. Trust me that made my night! This is the perfect recipe if you’re having company or need to take a meal to someone. You can make it early in the day and bake it when you are ready to eat. It also freezes well. Cook the pasta in boiling salted water until al dente. Drain and set aside. For the sauce: While the pasta is cooking, melt the butter in a medium saucepan over medium heat. Add the garlic and saute for a minute or two until fragrant. Blend in the flour and continue cooking over medium heat for about 2 minutes until bubbly. Slowly add the whole milk or ½ and ½ along with the Frank's hot sauce. Bring to a boil, reduce the heat and simmer for 2 minutes. Remove from heat and stir in the grated Parmesan Cheese. For the filling: Heat olive oil in a medium sized skillet, add red pepper and onion and saute for about 3 minutes until soft. 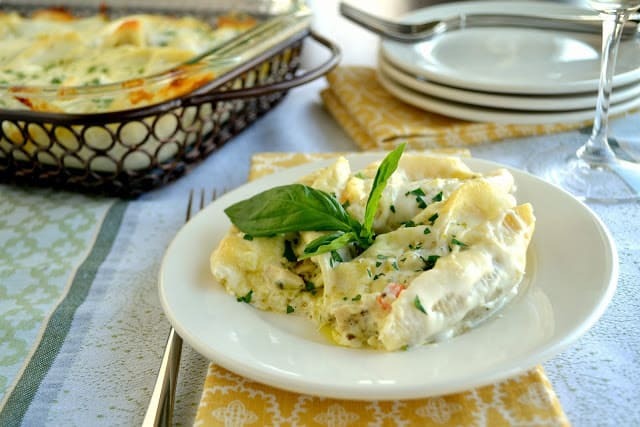 Mix sauteed vegetables with the chicken, 1½ cups Italian Blend Cheese, basil pesto and oregano. In a lightly greased casserole dish place about ½ cup of the sauce in the bottom of the dish. Fill the pasta shells with the filling and place in the dish. Spoon the Parmesan cheese sauce over the shells, cover the shells as much as possible with the sauce so they don't dry out when cooking. Sprinkle with remaining Italian Blend Cheese. Bake at 350 degrees for 30 minutes. Sprinkle with freshly minced Italian parsley if desired.